*** A Wall Street Journal bestseller *** From taxi rides, hotel stays, car driving, to communicating and paying, everything we knew as normal has changed beyond recognition. To lead effectively in today's brave new world, you have to question EVERYTHING. For the first time in human history, knowledge is free and almost every boundary to communication has been lifted. This open source world has permanently altered the business landscape. And you can count on the fact that the pace of change will only accelerate. Yet . . . companies still rely on management tools and practices that were, at best, mildly effective in their heyday. - What's the most effective leadership style in a world of 24/7 connectivity? - How has the very concept of leadership changed in the open source era? - How do you inspire and reward performance in the "gig economy?" - How do you measure engagement and effectively address the gaps? - How can you lead innovation--quickly and continuously? Peshawaria reveals the answers to these questions--and they will surprise you. Based on his company's groundbreaking research spanning 28 countries, he concludes that traditional industrial age thinking needs a massive upgrade to successfully navigating the brave new world of business. 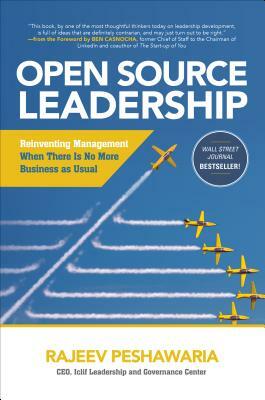 Open Source Leadership rewrites the rules of management, giving you a unique look at the most common misperceptions, illusions, and downright wrong information you've been getting about what works and what doesn't. It provides a new, counterintuitive model for seizing competitive edge in any industry. Among other issues the book argues convincingly that "positive autocracy" must replace democratic leadership; talent and innovation are abundant not scarce; early identification of high-potentials is counter-productive; and setting employees free to do as little as they want will increase productivity. Rajeev Peshawaria, CEO of the Iclif Leadership and Governance Center, is a business leadership and strategy consultant who works with Fortune 500 companies, government agencies and non-profit organizations globally. He served as Chief Learning Officer at Coca-Cola and Morgan Stanley and held senior positions at American Express, HSBC and Goldman Sachs, where he helped the firm found its leadership academy Pine Street.